I wanted my son to participate this year, since he is the actual person with Down syndrome. He helped me choose the pictures and I helped him “edit” what he wanted to say. He is 6 after all. The whole time I was typing this, him and his twin sister (who does not have Down syndrome) and big sister, age 9, were buzzing around me, fighting, arguing, trying to press the buttons, getting their heads in the way of my work, looking to see if far-away friends had messaged them, answering my questions, playing with toys, begging to go outside, putting on shoes without the socks and basically being nuisances to each other and to me. In a nutshell, that is a typical day for us. 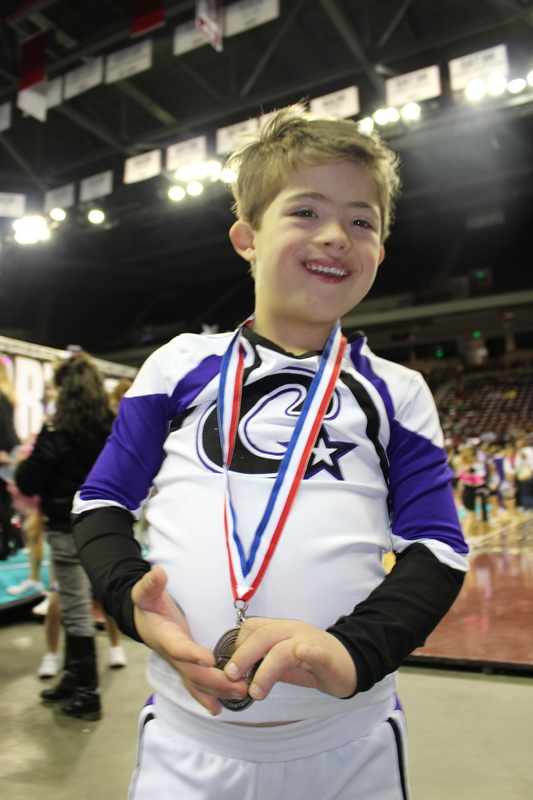 This is a picture of him receiving a participation medial at a cheer competition for the Angels, which is this fabulous cheer team where kids with disabilities are paired with a teenage volunteer to learn tumbling and aerial routines that they perform locally. In this place, with these people, he shines. That look on his face of pure pride and confidence? That’s real, so incredibly real. Some of his best friends are here, and every Friday we get to see them. He is especially fond of his volunteer, who is something of a big brother to him. What do you think about Angels, I asked him? “Angels, my friends. I look and I wave. I wave to you! Then I get some ice cream.” Apparently he has not forgotten the one time after a competition when myself and some other parents went for ice cream with the kids. “How did you feel when you got your medal?” I asked him. “Happy….eeeee….that’s e in the middle?” He said. “That’s not e, it’s a y,” piped in his twin sister with her usual exasperated authority. Day in the life? You betcha. 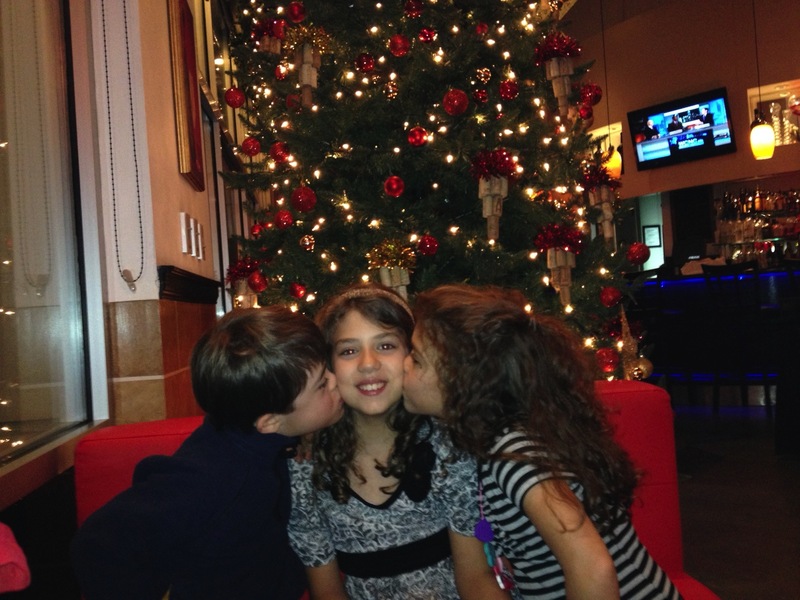 “I kiss Eva (big sister). I want to kiss Nino (that’s himself).” What else do you want to say? “Computers. Dinosaur Say Goodnight and Dinosaur Is Feeling Sick (two of his favorite books to read on the computer).” And? “I want to be Elsa and Eva can be Anna. Veronica (his twin) is Kristoff and Nino can be Elsa.” Frozen, if not his favorite movie, is the one he’s most obsessed with. He strongly identifies with Elsa and her unusual power. What else can you say about your family? Do you fight with them sometimes? “I learn about Greek and computers too.” They go to a partial Greek-immersion charter school and all of them, to my surprise and delight, love learning Greek. Another way to celebrate this day is to read this wonderful blog post by Kelle Hampton and consider donating to fund college scholarships for people with disabilities.